Fiona Dodwell is the author of The Banishing, a novel which has just been released by Damnation Books. From the UK, Fiona has crafted her story around the premise – how far would you go to save the one you love? I’ve always been fascinated with darkness. Ever since I was a child, I enjoyed curling up in my bedroom with a good ghost story. I loved to enter that dark realm – a realm where demons, spirits and hauntings took hold of my imagination. The seed of fear was planted in my mind when, as a child, I found a battered copy of Stephen King’s Pet Semetary in my brother’s bedroom. I devoured it in days, savouring that sinister and evil world that the author had so fantastically created- and then I was hooked. Fear was a friend, then, and still is today. I began exploring more of Stephen King’s novels, works that were probably far too disturbing for the mind of a child, but it changed something inside of me, and I started to hunger for more slices of darkness in literature. I poured over Edgar Allen Poe. I obsessed over Susan Hill’s ghost stories. They became something more than stories to me – they became a part of my everyday life. As I grew, I knew instinctively I wanted to create worlds like that myself: the fear I enjoyed reading was now something I wanted to create. So began my life-long passion of writing…. I engaged in all manners of writing at a young age: poetry, short stories, novels. I found myself winning writing competitions, and, after a time, I knew that this was what I wanted to do with my life: write. 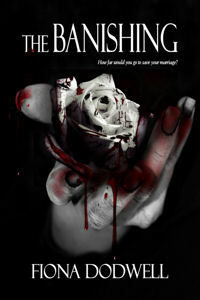 My novel, The Banishing, (which is available now), is my first full length novel to be published. It is full of darkness – exploring domestic abuse, demonic possession and one woman’s fight for survival. In The Banishing, I hope to take the reader on a journey, from dispair and anguish to hope and survival. I started writing The Banishing with one question in mind: How far would you go to save the one you love? From there, my character came to life and gave me that answer. The reader may find the answers that lie in the pages disturbing, but I hope they will enjoy it, and find hope in it. Thanks for having me over, Greg! Su – thanks for your congratulations! I've been enjoying Intricate Entanglement this morning! I can't wait until I order my copy here in just a few days! Fiona is a fantastic writer and her stories draw the reader in from the beginning. Great post! Welcome Fiona and congratulations! I was glad to read about your origins as a writer as well as to meet a fellow Edgar Allan Poe fan.